An average of seven people died every two days last month, according to the latest numbers. Feb. 17, 2017 6:00 p.m.
A total of 116 people in B.C. died of an illicit drug overdose in the first month of 2017, according to a new B.C. Coroners Service report released Friday. That’s an average of seven deaths every two days in January – the third highest rate of deaths per month in recent months. December still saw the most deaths – 142. A total of 914 British Columbians died of a drug overdose in 2016. The highest number of overdose deaths occurred in Vancouver last month, with 45. 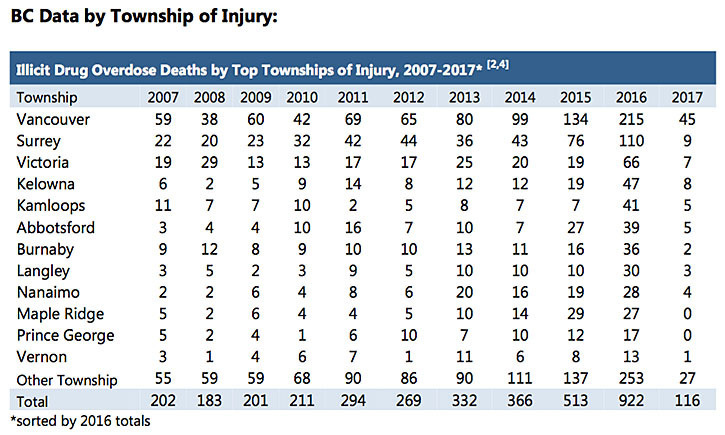 Nine people died in Surrey, down 16 from December. Eighteen people died of overdoses on Vancouver Island. And in the Interior Health region, which had the second-highest overdose rate, eight people died in Kelowna, and five in Kamloops. More than 90 per cent of all overdose deaths occurred indoors, the report said, but none of them at supervised consumption sites or overdose prevention sites. Lapointe noted many of those who have died are addicted and have not succeeded through a variety of treatment programs. “For these people, I think we would be wise to seriously consider the carefully considered suggestion made by provincial health officer Dr. Perry Kendall – the possibility of providing clean, medical-grade heroin to that small subset of users for whom nothing else has worked,” she said.